The lined paper called to me and brought a tear to my eye. Could I still feel this way? After all these years? The note on the paper was simple, but its message was more than met the eye. In that brief encounter with the Lord, I knew this was another one of the painful pruning episodes that was necessary for my growth and yet the pain left me feeling raw and vulnerable. He explained that he knew Mother’s Day was coming up, and he thought I might not miss my deceased mother quite so much if I wrote a letter to her and God sharing my feelings. A sweet suggestion, but my initial response wasn’t quite so sweet as I shared with him that I didn’t think I could do that, as it would be too painful and make me cry. And yet, I sensed God had something to show me in that exchange. My mother and I were not incredibly close during my youth. She was from another country, and because of that cultural influence, was not prone to sharing her feelings or affections, even to a daughter who so desperately craved them. What I didn’t realize when I was young was that she was weighted down by a blanket of heaviness and depression most of her adult life. And, to make matters worse (or so I thought as a child), my mother firmly believed she was to be my mother and not my friend. Yet I looked at my friends and saw the friendship they had with their mothers, and I was left yearning. Only after I grew up and moved out on my own, did a wise doctor diagnose the problem and provide much overdue treatment. Only then, for the first time in over twenty years did I see the joyful woman God created my mother to be. As I became a mother, and my mother continued to heal and experience more of the abundant life God had for her, then we forged a new relationship. Unfortunately, just as we were beginning to appreciate a new found friendship, her life was cut short – which left my aching heart wounded and gaping. This Mother’s Day, I wonder how many other countless women have an aching heart. Women who didn’t or don’t have a good relationship with their mother. Women whose mothers are no longer in their lives because of illness, death, divorce, imprisonment, or emotional rejection. Women who long to be mothers but haven’t seen the fulfillment of their desires. Women who are mothers but don’t have a close relationship with their children. Women who have lost a child due to illness, death, or wandering. Women who don’t know their mother. God created us for fellowship. Fellowship with Him and with others. But there is no denying that being in relationship with others is hard, and often painful. Holidays are not always smiles and Hallmark cards for everyone. If this Mother’s Day is painful for you, will you give God that pain and let Him bring comfort and healing? I’m going to write that letter to my mother that my son suggested. Will you do the same? I’ll be sharing more on next week’s post, Dear Mom – Part 2. This is beautiful. I have tears as I think of family and friends who have lost children, walked that infertility route, and I experienced a Mom with depression too – watching her change from my early childhood, and then God was gracious to let me fall in love all over with her for years before her death. It sounds like we have many of the same sentiments in common. There is much to be thankful for, and as we approach Mother’s Day, so many to have compassion for as they face the pain of Mother’s Day. Let our light shine and comfort them with the comfort we have been given. This was so beautiful and encouraging, Dr. Michelle. Thank you for touching a deep part of my heart and sharing yours. I shared this, so many woman can be blessed by your words and His Truth. Thank you for your encouraging words. I pray this touches many who might feel alone, abandoned, rejected, or despairing this Mother’s Day…those who need a touch from Him. Thank you for sharing – that blesses me immensely. May it reach those whom He wants to hear. Thank you for your post! I know many who would love to hear this! Thank you for your sweet words. They bless me. Feel free to share with anyone you think this may bless. Hope Prevails! 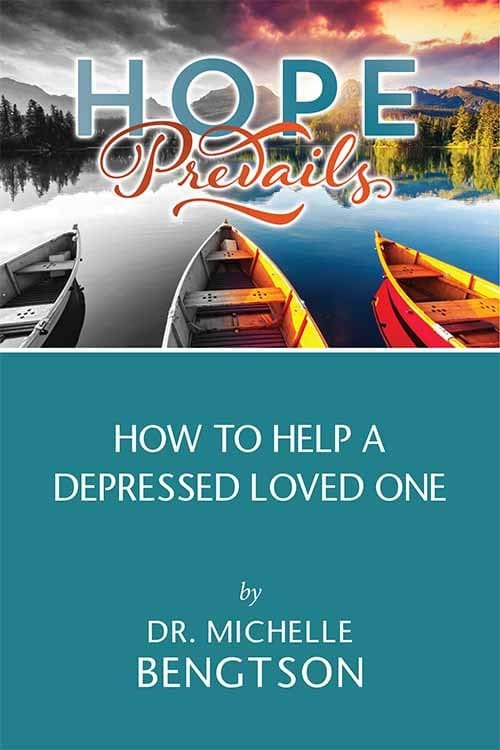 great idea Dr M. my mom struggled with depression much of her adult life too…she just didn’t do much about it. i think she tho’t it wasn’t christian to be depressed:( a vicious cycle! when i hit 4ish, i was in a car accident with chronic pain that was out of proportion to the injury. fortunately, i found the help i needed for physical therapy to help pain control and a good christian counselor who helped me with some difficult issues from childhood. i had been living in denial b/c my problems weren’t as bad as those of many others i knew…not the best way to deal with pain for sure! as i grew from that period, i had to learn to relate differently to my mom…not an easy stage. with each visit (she lived out of town) we progressed to an adult relationship instead of a childish, reactionary on on my part. years later, after suffering a year or so with dementia, she passed away. it was helpful for me to write out a memory of her so that some of her grandchildren would hear positive words about her. just sitting down and putting the positive words down helps our attitude change. we often see how much we took for granted. Yes Martha, sometimes just the act of writing a letter or journaling clarifies things we couldn’t see clearly before – even if no-one else ever reads our thoughts. Our Heavenly Father can bring healing when we will share with Him our deepest hurts. I’m sorry to hear of your mother’s passing, but I thank our Lord that you were able to grow in a healthier relationship with your mother before she passed away. That was God’s mercy, for sure. Blessings to you on this upcoming Mother’s Day. Mother’s Day is hard for mothers who’ve lost their children too. This is such a good reminder for thinking of those who’ve lost, especially on those days designed for celebration! Yes Carol, there are so many in different situations than we are, who need to know they are thought of and cared for as well. I hope this Mother’s Day will provide you with moments to rest and reflect. Hope Prevails! 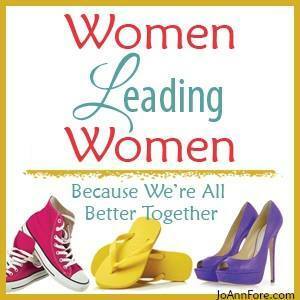 Thank you for including all kinds of women “hurting” this Mother’s Day…. my mom has been gone for over three years – and I still feel the pain…. I loved her dearly and she was such a blessing to me and my children. I miss her so much! Clare, I can feel the pain of your heart in your words. I can understand. I still miss my mom, and she’s been gone many years. Our mothers have a profound impact on our lives and in our hearts. Hug your children every day with gratitude that you get one more day to spend with them. We never know how much time we will have. Hugs to you this Mother’s Day. What a beautiful idea your son had! I love how God can use anyone to speak wisdom into our lives. I have a friend who recently lost her daughter–any suggestions for helping her through this holiday? Oh Anita, I’m so very sorry for your friend and for you. I can’t think of any tragedy harder than losing one’s child. My thoughts and prayers go out to her this Mother’s Day. Help her celebrate her daughter’s life. Remember the good times. 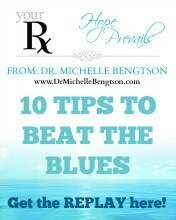 I recently wrote a post in my “Ask Dr. B” column that addresses this very topic. 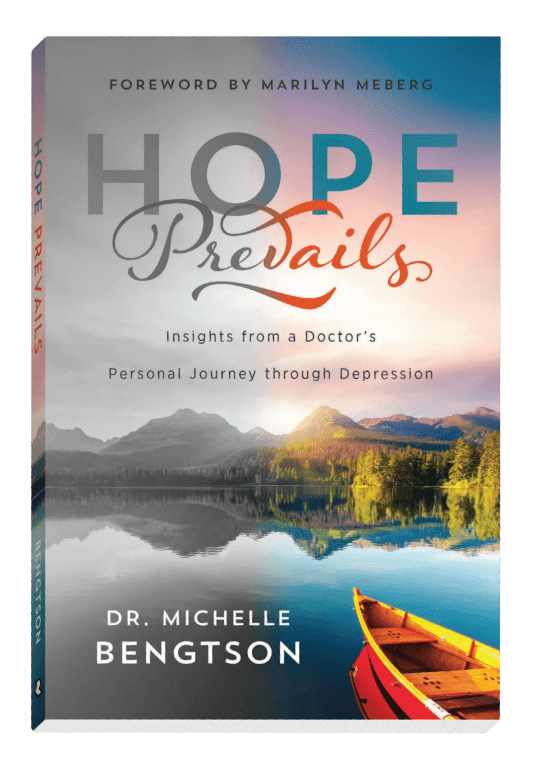 You might find it helpful: https://drmichellebengtson.com/how-to-comfort-a-friend-who-has-lost-a-child/ Love her and support her, for surely Because of Him, Hope Prevails! Such a honest post. I am blessed to still have my mom and I have not lost any little ones, but this time of year I always keep moms of angels and kids missing their moms in my prayers. That’s very kind of you Robbi, to remember those who might be struggling through a painful Mother’s Day in your prayers. We must appreciate what we have while we still have it. Our next breath isn’t guaranteed. Blessings to you and your mother on this Mother’s Day. This is such a beautiful reminder. Mother’s Day is a complicated holiday, for countless reasons, and I’m so thankful for the reminder of all the women we love who are hurting this week. Thank you. Definitely sharing this. Thank you for sharing Elizabeth. I hate to think of any of these hurting women feeling not only saddened, but alone and unsupported on a day meant for celebration. Blessings to you! My mom and I were close – we definitely “had our moments” over the years but always got through them. This is my third Mother’s Day that I won’t be buying the flat of pink Impatiens for her front porch – I miss her very much. I’m so sorry you’ll be spending this Mother’s Day without your mother physically present with you. But I’m so glad that it sounds like you have some wonderful memories to be like rainbows on the dark rainy days, reminding you of the good times you had with her. Blessings to you! This was a hard post for me to read but well needed. Your tweets are just right on. I needed to dig deep and read through this…and I’m better for it! Thank you! Oh Sweet Bethany, how I can relate. It wasn’t easy for me to write it either. Just wait until next week’s post – that was really hard to write. But God can bind up the brokenhearted when we will bring Him all the broken pieces. I’m so glad you stuck through it. I pray He brings healing so the shattered places, and gives you beauty for ashes Sweet One! Hope to see you next week. This was a really sweet/helpful post. I miss my mom too. I’m thankful we were close while she was alive. And I’m happy to hear your mom finally got to feel better. Thank you for sharing your story at the Inspire Me Mondays Link-Up. Have a wonderful week! Holidays like Mother’s Day can serve as a reminder of what we’ve lost, or we can allow Him to use them as sweet remembrances of ways He has blessed us in the past. I pray you will feel blessed this Mother’s Day. I hope you’ll come back for “the rest of the story” in part 2, Rachel. God is so good and He’s so very faithful to keep His promises. Blessings Dear One! Thank you for your sweet words of encouragement Meagan! I hope you’ll return for Part 2 next week. Because of Him, Hope Prevails! You do a really good job of acknowledging all kinds of emotional pain associated with Mother’s Day. I really appreciate blogs about this topic. I’m not fond of the Hallmark holiday, even as a mom. I look forward to seeing Part 2! Blessings to you from “Espressos of Faith” via #MakeADifferenceMondays! Thank you Bonnie Lyn for your kind words. Maybe it’s from being a neuropsychologist in the mental health field for over 20 years, or maybe it’s just that the Lord has given me a heart of compassion for the hurting in all situations and walks of life, but I’m ever mindful that things are not always as they seem at first glance, or especially as they might be portrayed on social media. I want this to be a place for people to find hope, help, understanding, comfort, and acceptance – to His glory. Thanks for stopping by. I look forward to seeing you next week for Part 2! 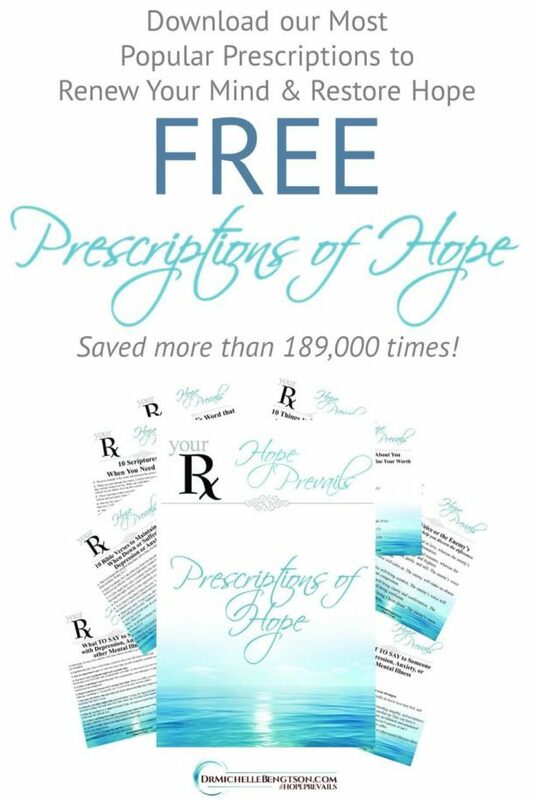 For it is Because of Him that Hope Prevails! Beautifully said. I’ve been in a season where Mother’s Day was hard, but looking back God did encourage me in other ways, through other friendships. Grateful for your encouragement here – it’s a much needed topic. Thanks for linking up at #ThreeWordWednesday. Kristin, thank you for your testimony to God’s faithfulness. I definitely do believe we go through seasons. Some will be easier than others, but He is faithful to provide and He is faithful to heal the brokenness if we will take Him the broken pieces. Blessings to you this Mother’s Day. This is beautiful! I was just wondering what to do for my own Mother this year… I am blessed that she lives right next door and doesn’t want for much – which can mean she is difficult to buy for – but this post inspired me… I think we will simply visit over lunch and listen to her share stories of her own Mother -whom she lost way too young. I hadn’t really considered how she may be missing her on Mother’s Day – butI’m sure she does! I can’t wait to read Part 2 and am so glad that we are neighbors over at #SmallWonders! Oh Karrileea, I’m sure that would delight your mother to be able to pass down to you memories of your grandmother! I’m glad this post inspired you. Isn’t God good?! I look forward to seeing you back here for Part 2! Blessings to you and your mother on this Mother’s Day! Oh my, what a precious post! I have tears in my eyes as I write these words…. You see, I have been blessed with a beautiful mother – beautiful on the inside and out. She is not only my mom, but she is my best friend and ever since I was a child she has played both parts in my life. After reading this post I am more aware that not everyone has that….and it makes me sad. How I thank the Lord for His goodness and I am grateful for a sweet mother. Thank you so much for sharing this with Roses of Inspiration. My eyes were opened and my heart was softened. Blessings to you! Stephanie, so many are left hurting and wanting this upcoming Mother’s Day and Father’s Day for they cannot say what you can. But the wonderful news is that God longs to fill that void for them and be the most wonderful parent we can ever ask for. But you can be a blessing to them as well with your softened heart of compassion! I’m so glad you had a wonderful relationship with your mother–cherish the time you have with her, and love on others who were less fortunate. Because of Him, Hope Prevails! Oh so beautiful! Mother’s Day can be very hard for so many women.What a thoughtful idea! I’m so very blessed that you stopped by Stacey. I pray He blesses you mightily today and every day. Thank you for your sweet words of encouragement to me today. Blessings! As a mom, Mother’s day can be one of the most fun and lovely days of the year, but it can be one of the hardest for so many others. Thanks for sharing! Thanks for stopping by, and taking the time to comment Maria. I’m blessed to have a special reason to celebrate, but it hasn’t always been a celebratory day, so I’m mindful of those for whom the day brings pain and tears. I hope the day brings joy for you! What a beautiful piece of writing! May God be with you this Mother’s Day. I know that I am so grateful to still have my mom and be a mom myself. God Bless you. I hope this Mother’s Day is a special one for you and your mother! We never know how long we will have the blessing of our loved ones in our lives. Enjoy your family, and I hope you’ll stop back by for Part 2! You’re so welcome Leanne. I’m blessed that you stopped by. I hope you’ll come back for Part 2! I pray you’ll have a lovely weekend, no matter how you spend it. Michelle, found your post via Playdates with God. Also see you in the Healthy Living fb group. It is hard to think about my mother, who also suffered with depression (probably) and Parkinson’s. I’ll think about what I would say to her. This is a thought-provoking post. Constance Ann, praying that God will help you work through any pain that may linger there. I think you might find Part 2 to be thought-provoking too. They both were hard for me to write, but God is so faithful. Because of Him Hope Prevails! Aww, so touching and beautiful. I wish I could give you a big hug. I am certain the Lord will help you to heal and work through your grief. Praying for you. Thank you India. Your sweet words are a blessing. 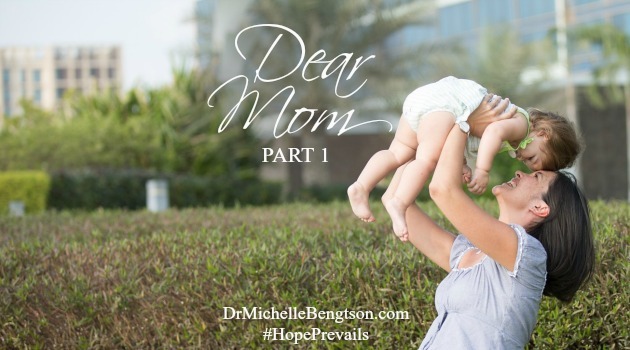 Part 2 is up https://drmichellebengtson.com/dear-mom-part-2/ Hope to see you back soon. Good morning, dear Dr. Michelle! I wanted to let you know that this wonderful article has been featured at Roses of Inspiration. Thank you so much for sharing. Have a lovely day! Thank you for your thoughtfulness Stephanie! I pray it blesses others. I hope you’ll come back and let me know your thoughts on Part 2: https://drmichellebengtson.com/dear-mom-part-2/ Blessings to you! Pinned! Thanks for sharing at Women With Intention Wednesdays! That blesses me greatly. 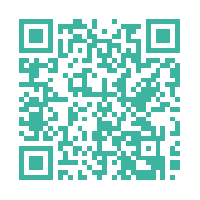 I pray it blesses your readers. 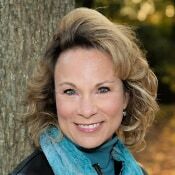 I hope you’ll come back and let me know your thoughts on Part 2: https://drmichellebengtson.com/dear-mom-part-2/ Blessings to you! Oh my goodness, Dr Michelle, how much I needed to read this . I am crying, while reading, but I need it to cry.. Thank you, Jesus!! I had being feeling so sad every time I see a tv ad for Mothers Day, all the stuff at the stores. My mommy left this earth to be with Jesus, 3 years ago (Saturday April 13, 2013 ). She was my mommy, but she was also my best friend, my prayer warrior. But I know that she is completely heal & I will see her again. How much I missed her!! Thank you, thank you for allowing the Holy Spirit to use you! I’ll continue praying for your complete healing & rebuking the enemy!! STOMP?? in JESUS name!! I can’t wait to read your book. I’m so very sorry for your loss. I know how hard it is to face big holidays, like Mother’s Day, without the ones we love, especially when those loved ones were also friends and prayer warriors. One of my closest friends and biggest prayer warriors died the day before Mother’s Day last year. It was a huge loss. But God is gracious and brings others into our lives who, while they can never fill the void, they do bring joy. And He lets us be the light and joy in others’ lives which in turn brings us joy! May you feel His comfort this Mother’s Day! Because of Him, Hope Prevails! Thank you for this. Mother’s Day can be tricky at times and this year has been difficult. Often we aren’t given permission to admit it isn’t all rosy so I appreciate your honesty and courage here. Blessings to you!